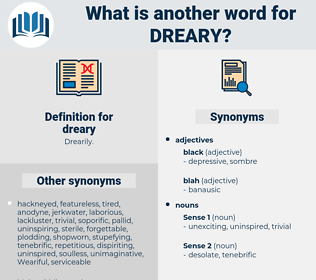 What is another word for dreary? annoying, gloomy, grim, bleak, miserable. exciting, lively, colorful, nice, hopeful, happy, light, encouraging, glad, interesting, joyful, pleasant, cheerful, eventful, clear, bright. awesome, animating, moving, joyous, optimistic, lighthearted, marvelous, spellbinding, amazing, mesmerizing, friendly, comforting, eye-opening, provocative, enlivening, uplifting, heartwarming, lightsome, invigorating, spectacular, cordial, beguiling, sunshiny, astonishing, fabulous, energizing, astounding, touching, rousing, wonderful, tantalizing, buoyant, wondrous, sensational, surprising, suspenseful. The rain made a dreary sound outside the window, but in three days he would be at Schlestadt. She told herself that there was no hope of finding Anna in such a large place, and that it was unlikely that this dreary - looking town would offer anything in the least pleasant or amusing on a very hot day. deodar, dower, draw, deary, dead air, durio, drier, Diarrhea, durer, doorway, draw away, deere, doura, door, dior, doer, dewar, dory, datura, didder, dourah, detour, dodder, dryer, dither, drear, drey, dare, doddery, drawer, dodderer, death row, dire, death adder, duty tour, drew, derriere, dry, dearie, diarrhoea, dietary, dowry, dowery, dura, drawee, dray, darrow, dyer, deter, deer, diary, dear, dari, Dieter, dairy, durra, Dr., dour.